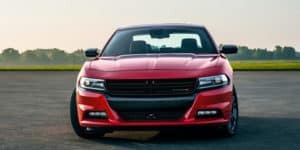 To the layman, the difference between the Dodge Charger and Dodge Challenger is that the former is a four-door sedan while the latter is a two-door coupe. But their differences go deeper. While both cars use the same drivetrain and engines, the Charger and the Challenger serve different customer bases and this is evident in their design. Because both cars use the same engines, the Charger and Challenger have similar performance metrics. Challengers with a V-6 engine can dash from 0 to 60 mph in 6.3 seconds while Chargers with the same engine cover the same distance in 6.2 seconds. With the 5.7-liter V-8 engine, both cars complete the 0-60 mph dash in about 5.1 seconds while the 6.4-liter V-8 engine-powered Charger edges the Challenger by one second to reach 60 mph at 4.1 seconds. These cars deliver a powerful performance, but handling may not be seamless because of their huge bulk and old design. However, the Charger Hellcat and Challenger SRT Hellcat Redeye offer a mind-blowing driving experience. There is a marked difference in the styling of the 2019 Dodge Charge and the 2019 Dodge Challenger. The Charger keeps the classic sedan exterior although in a more muscular form. Its wheelbase is four inches longer compared to the Challenger, and its four doors make the car unmistakable from its coupe cousin. It is also taller and offers improved visibility. The Challenger has a low and flat roof and a long hood that reduces outward visibility. It comes with round headlights of earlier designs and the pronounced musculature that has endeared so many people to the model. The sculpted sides, large wheels, and long hood are all vintage Dodge signature. The main difference between the Charger and the Challenger in the interior department is that the former offers more interior space because it is a four-door vehicle. However, both cars use the same dashboard, infotainment systems, steering wheels, and controls. Unlike the Challenger which can only carry four passengers, the Charger has enough room for five passengers plus plenty of leg space. The Challenger and the Charger feature a standard 7-inch touchscreen infotainment system. A premium package allows you to add a Harmon Cardon high fidelity sound system, 8.4-inch screen, built-in navigation, and extra USB ports. The Charger comes with two additional USB ports and one 12-volt outlet in the back seat to allow passengers to charge their devices on the go. For drivers keen on performance, the Charger has an optional 6-speed manual transmission. However, both cars come with an 8-speed automatic transmission standard. The cars also feature rear-wheel drive and all-wheel drive models and the standard trim is powered by a 3.6-liter V-6 engine and has similar fuel economy. The new 2019 Dodge Challenger SRT Hellcat Redeye is powered by a 6.4-liter V-8 that delivers a monstrous 797 horsepower to an 8-speed automatic transmission. This powerful engine delivers raw, undiluted performance and a sonorous exhaust that sets the road on fire. The 2019 Dodge Charger and the 2019 Dodge Challenger are almost the same. The only difference is in the number of doors and profile. Choosing one of the two is a question of space, styling, and preference.